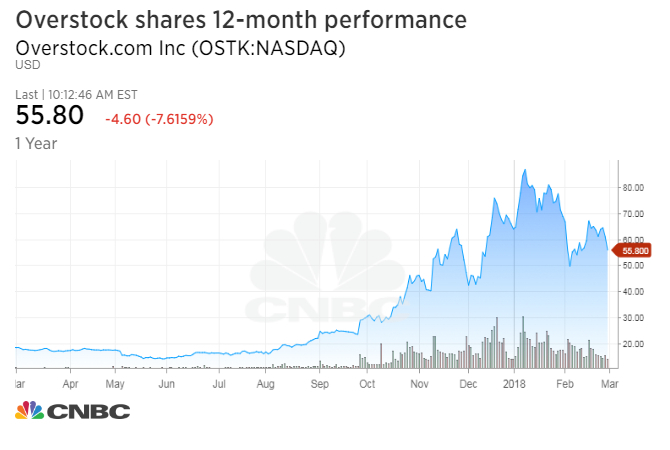 Shares of Overstock.com fell Thursday after the e-commerce retailer that’s announced cryptocurrency operations in the last year disclosed the Securities and Exchange Commission is investigating the firm over digital tokens. Overstock shares briefly fell 10 percent in morning trading and were trading about 6.5 percent lower near $56.50 a share as of 10:33 a.m., ET. The disclosure comes as the SEC has toughened its language on sales of new digital tokens, or initial coin offerings. The fundraisers for projects that sometimes barely exist beyond a whitepaper raked in the equivalent of more than $7 billion since 2016, according to financial research firm Autonomous Next. On Wednesday, The Wall Street Journal reported, citing sources, that the SEC has issued “scores of subpoenas” that include demands for information about initial coin offerings. The SEC declined to comment on the report and Overstock’s disclosure of an investigation. The e-commerce company, headed by Patrick Byrne, did not immediately respond to a CNBC request for comment. Overstock.com’s subsidiary tZero is raising $250 million through a token sale and announced in late September it was forming a joint venture to launch a digital coin exchange. The company has also said it has a license for an alternative trading system through another acquisition. However, Thursday’s filing said subsequent to the initial announcement, “the parties determined to no longer pursue the development of an alternative trading system.” The filing also said two of the parties are re-evaluating the potential joint venture. The statements indicate “the development of an ATS may take longer than anticipated,” Tom Forte, analyst at D.A. Davidson, said in a phone interview with CNBC. He expects Overstock shares to roughly double to $110 and said the company’s disclosure of the SEC investigation is “bending over backwards” to make sure they have appropriate compliance. Forte also expects a potential sale of Overstock’s e-commerce business will help the stock. Shares began soaring last fall amid bitcoin’s surge after Overstock announced plans for entering digital coin trading through tZero. Shares are up about 200 percent over the last 12 months but are down more than 10 percent for the year as of Thursday morning. “To me, people overreact to the blanket SEC investigation and they should focus on the successful presale of the ICO,” said Marc Cohodes, an independent investor and long-time short seller who announced his positive turn on the stock in the fall. Cohodes still expects Overstock shares to at least quadruple from current levels to between $200 and $400 a share. TZero said in a separate filing Thursday that it has raised about $114.6 million worth of tokens from roughly 1,100 purchasers so far. About $100.6 million has been funded, the filing said. Investors have made heavy bets against Overstock shares. According to FactSet, 43.5 percent of shares are sold short, or in anticipation of a price decline. However, the company is a holding, often one of the largest, of the blockchain-focused exchange-traded funds that launched in January. George Soros’ firm also disclosed a 2.47 million-share stake in Overstock in the fourth quarter, according to a required filing with the SEC in February. That makes Soros Fund Management the third-largest shareholder, behind Patrick Byrne and Morgan Stanley Investment Management, according to FactSet. Correction: An earlier version misstated the timing of 8-K filings. They are reports of unscheduled events or changes that could be important to shareholders.